The Lompoc Boys & Girls Club graduated 71 students from their intense 26 week TEEM OUTREACH PROGRAM. 120 youth started the program. This program - did for 71 kids exactly what you did with all the youth you met as a police officer. You would have been very proud of this group. -Promoting successful achievement in schools and decrease negative outcomes. -Helping young people develop life skills. 20 hrs. of community service. -Value young people as assets and resources. -Forging strong community wide partnerships. -Connecting learning gained through service experiences during Clubhouse activities. The ceremonies were conducted in the RICHARD MAY COURT. 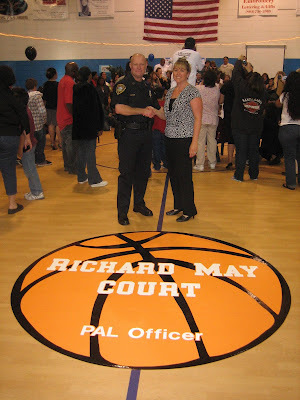 The gym dedicated to Officer Richard May during 2008. 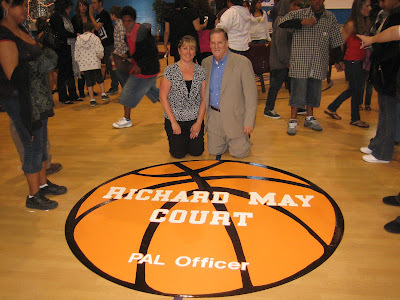 During the evening, the Richard May Court Floor marker, donated by his father, was unveiled. Pictures are below. Follow this link to a Letter to the Editor in the Lompoc Record. Captain Don Deming of the Lompoc Police Department and Club Director, Dena Lara, are in the photo on the left . The second photo includes Dena and Rick May, Rich's father.